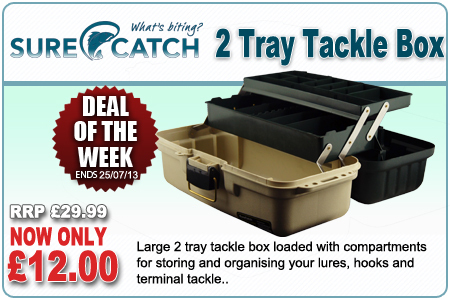 Deal of the Week is the Surecatch 2 Tray Tackle Box - RRP £29.99, now only £12.00! If your tackle is building up and are running out of room, then this superbly priced hardwearing and durable Surecatch 2 Tray Tackle Box is ideal. It has 2 multi-purpose trays and is loaded with compartments for storing and organising your lures and spinners, hooks and terminal tackle.